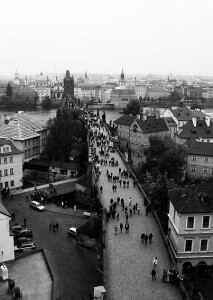 Charles Bridge – the history – The original bridge over the River Vltava was named the Judith Bridge, after Queen Judith of Thuringia, who was married to the Bohemian king Vladislav II. It was the work of an unnamed Italian architect, although his nickname ‘Bradac’ has survived. The Judith Bridge was almost completely destroyed on the 3rd of February 1342, however, in one of the devastating flash floods that affect the Vltava from time to time, which flung sheets of ice against the pillars. Part of the bridge’s foundations remain underwater on the Malá Strana side, and so if you look carefully at the current bridge, you will see it kinks a little rather than following a straight course. This is so they could avoid the old foundations. You might also notice there is one tower at the Old Town end of today’s bridge, but two at the Mala Strana end. The smaller of these two towers originally stood at the end of the Judith Bridge. A replacement was ordered by the then king Charles IV, who employed a Swabian architect, Peter Parler, to design it. Parler was also responsible for building, amongst other things, the Tyn Church and St Vitus Cathedral. Bruncvik’s statue –If you take the tour, you might hear your guide mention Bruncvik’s statue as one of the points of great energy on the bridge. 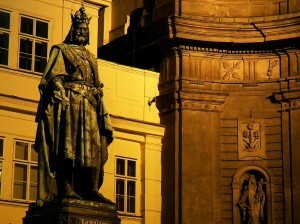 This statue of a young man in armour with a sword gazes from the Malá Strana bank towards the Old Town, and is said to represent a legendary Czech figure, Bruncvik, who was similar in some ways to the ‘Knight Roland’ of French and Germanic legends. He is said to have gone on a long sea voyage and fought several legendary beasts, including harpy-like, flesh-eating birds and a seven headed dragon. Bruncvik arrived to find a lion already fighting the dragon and stepped in to help, and in gratitude the lion then became Bruncvik’s companion. They continued their journey, along the way acquiring a magic sword that could behead people on its own, and eventually returned home. Similar to the story of Odysseus, Bruncvik returned to find his wife about to marry another man, but slipped a gold ring into her goblet so she would know he was back, then killed his rival. The lion remained with Bruncvik until he died, when it also passed away, supposedly of a broken heart. 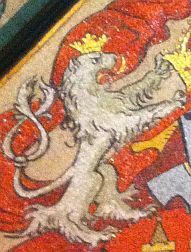 According to some, this is why the lion is still used as the symbol of the Czech lands, (its two tails are said to be for Bohemia and Moravia, the two main princedoms that form what is now the Czech Republic). Bruncvik’s magical sword is said to be hidden somewhere in the bridge to this day, although some believe the sword of St Wenceslas, which is often on display in the Malá Strana bridge tower, is actually Bruncvik’s. Some scholars believe the story of Bruncvik’s journey is actually a coded description of alchemy, with the various animals he fights and defeats representing different stages in the process to transmute base metals into gold. Certovka – The Devil’s Stream – As you explore the bridge, whether on the tour or on your own, you might notice that on the Malá Strana side of the bridge there is a smaller stream coming off the Vltava and running underneath part of the Charles Bridge. 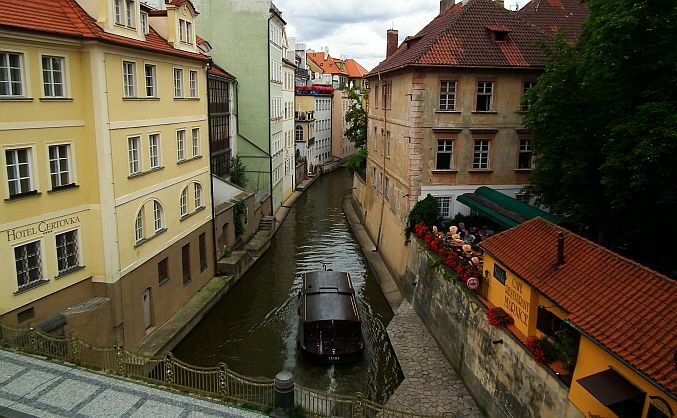 This is known as the Certovka, ‘the Devil’s Stream’. It is artificial, and was originally made to power several mills, and in fact you can still see one of the wheels today. The stream was once known as Rozmberk’s Stream, after the Dukes of Rozmberk, who owned the land for some time. The Rozmberk family were once one of the most powerful in Bohemia, advisors to kings and builders of great castles and churches, especially in the south of the country. Many were also said to be alchemists, particularly Vílem of Rozmberk, who lived during the reign of Rudolf II, and like Emperor Rudolf, was very interested in the occult. He had an alchemical laboratory at his chateau in Třebon, one of the many towns where the family owned property, and for a time sponsored the English alchemist and ‘psychic’ Edward Kelley. Vílem died without heirs, as did his brother, Petr Vok, and so the line died out in the seventeenth century. The name ‘Certovka’ supposedly comes from a foul tempered old lady who lived in one of the houses, called ‘At the Seven Devils’, along the stream, and who would shout curses from her window if any local children came too close.